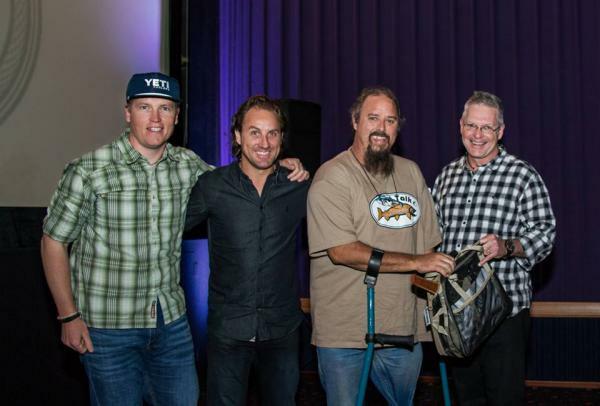 The F3T-SA team of Jako Lucas (Captain Jack Films), Keith Rose-Innes (MD, Alphonse Fishing Company) and Pieter Taljaard and Colin Campbell (Vagabond Fly), kindly allowed FOSAF to canvass for membership and to fundraise at the three showings across the country. FOSAF did well by recruiting some 45 new members, while existing members donated generously towards FOSAF funds. The FOSAF drive was assisted by a hamper of fly fishing goodies that was on offer by lucky draw at the end of each of the shows, for people signing up or donating at the three events. The contents of the hampers were donated for the drive, and each comprised of a stream net from Bushman’s River Nets (made by Andrew Savides), a fly box with a selection of stream flies from Anglerfish Fly Fishing Services (Jan Korrûbel), a wader/boot bag from The Split Cane Agency (Brett Giles), and Andrew Fowler kindly donated copies of his book, ’Stippled Beauties: Seasons, Landscapes & Trout’. Congratulations to the winners of the hampers: Andrew Strachan (Johannesburg), Sharland Urquhart (Cape Town), and Sheldon Sink (Durban) – thank you for your support. From the F3T-SA sponsors, there were also a number of other fantastic prizes that were given, thrown and raffled during the three events – a big thanks to all who made this event possible and generously gave R250,000.00 worth of prizes : Alphonse Fishing Co, Captain Jack Films, By Invite Only, Simms, Costa, Flyz Inc, Cortland, Yeti, Poison City Brewery, Nautilus, Columbia and Thomas & Thomas Fly Rods. Congratulations to all who walked away with the wonderful prizes! Look out next year for a bigger and better F3T-SA 2017. FOSAF is the representative body for recreational fly fishers in South Africa. Member support is required for the campaigns and action carried out to protect trout and other fly fishing; our programme seeks to increase the number of fly anglers across South Africa. Visit our website at www.fosaf.co.za for more information. FOSAF welcomed the opportunity to spread the word - the success of the evenings can be attributed to the fact that FOSAF had access to a large number of dedicated fly fishing enthusiasts – a captive audience if you will! In addition, a document was made available that summarised the dispute with the South African environmental authorities over the status of trout in terms of proposed legislation and the current trout mapping process. FOSAF is fighting for the future of YOUR fishing, but we need YOUR support to do more. If you want to protect your fish and fly fishing, for now and in the future, join your representative body today. FOSAF has a proud history and legacy of service to fly fishing. We urgently need your support so simply Click here to join FOSAF.